KARACHI: At the 5th Diplomatic & Foreign Investment Award 2019 event, held at the Chief Minister House Karachi, attended by numerous distinguished diplomats, businessmen, and politicians from 20 countries across the globe such as US, UK, and Japan, honorable chief guest, Syed Murad Ali Shah, Chief Minister of Sindh presented shields as a token of thanks to the countries made investment in Pakistan, says a Press release. 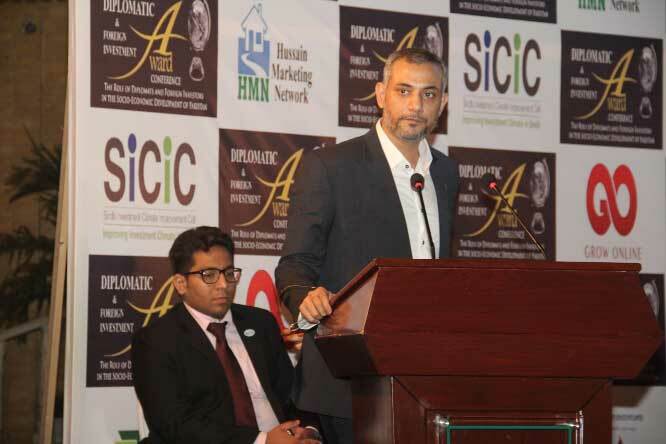 The President Diplomatic Forum, Asif Haroon officially announced the establishment of the ‘Mass-Entrepreneurship & Innovation’ committee and later presented by its newly-appointed chairman, a renowned Pakistani entrepreneur and founder of Grow Online Inc. Zeeshan Niaz Ahmed. Ahmed was announced as its official chairman at the event. Mass Entrepreneurship & Innovation committee is an organization that will be working on the establishment of different private and government-based projects in Pakistan with a goal of boosting the employment, promoting technological innovation, and stimulating industrial and economic growth. During the event, Ahmed talked about the importance of entrepreneurship and creating the ideal environment for business startups, retail ventures, and innovation across the board. This means creating more opportunities for entrepreneurship-driven employment and acceleration. Furthermore, Ahmed presented investment, R&D, and other benefits and potentials of mobile commerce, entrepreneurship, and Go’Mobishop to the public, a product which is focused on supporting small merchants and enabling them to launch their own native mobile apps without any major costs or development requirements, a factor that could boost the advancement of the economy and Pakistan. UK Pakistan Chamber of Commerce and Industry was established in 1984 with the aim of promoting trade and investment between the UK and Pakistan. Since then, has grown considerably to become a highly recognized entity in various business circles in both regions, as well as being recognized by the respective governments regarding efforts to boost trade.